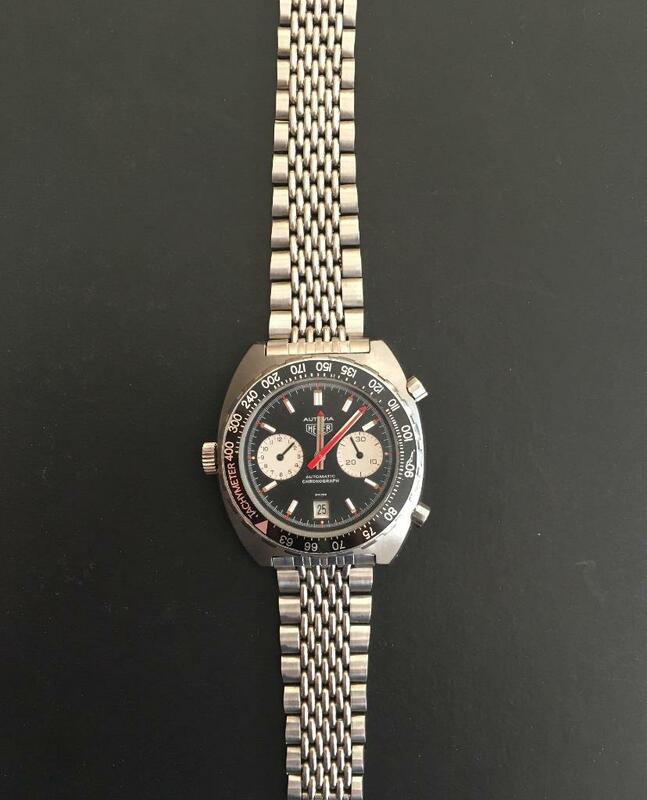 If you own one of the large case vintage Heuer Autavia or Heuer Skipper models with case references 11063, you know it’s a real challenge to find metal bands for these 21mm straight-lug Heuer favorites. 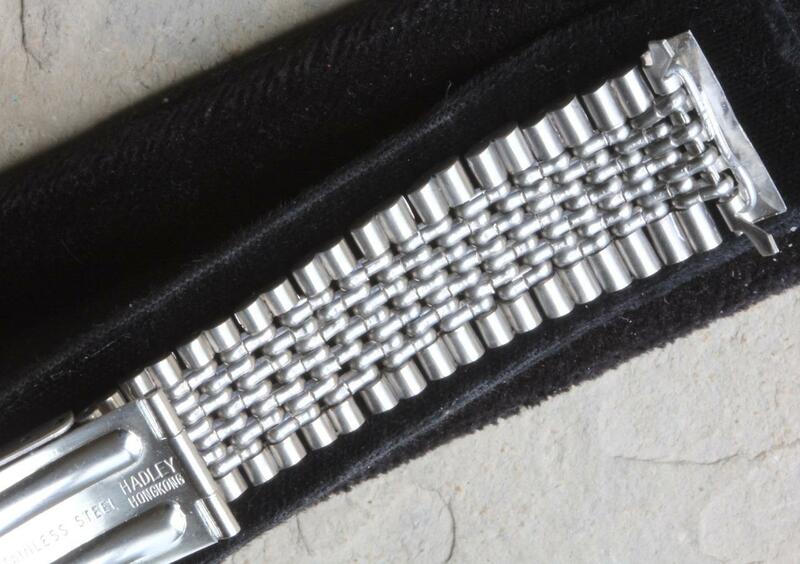 The band shown here is a vintage Beads of Rice band modified version with 21mm straight ends we are now offering for the Heuer 11063 models. 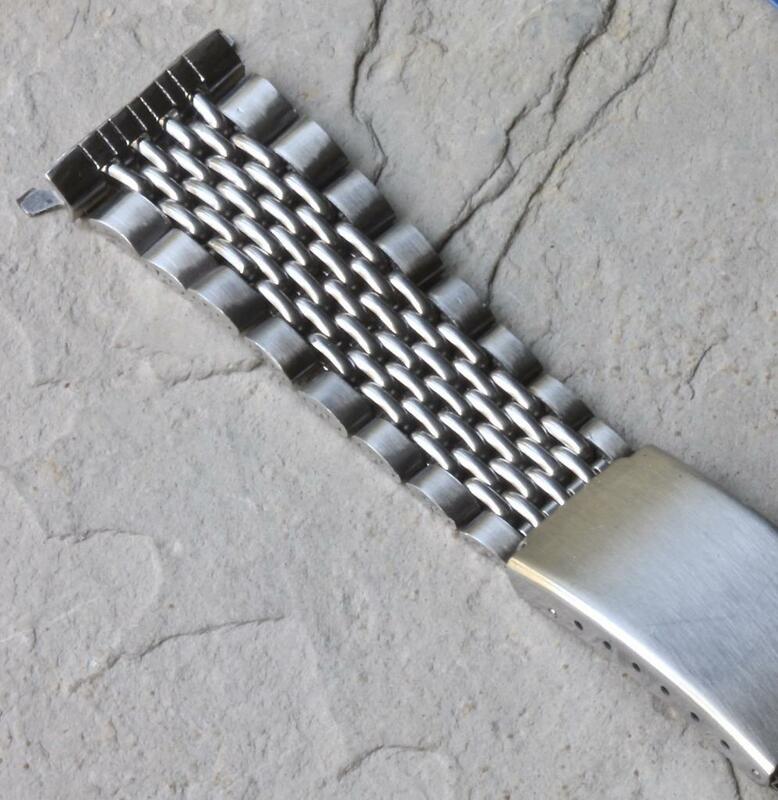 This is a new variation of the popular modified 1163 case 20mm BoR bands we have been selling here for some time now. The look of this new combination for your 11063 is ideal. CUSTOMER QUOTE: "It looks perfect. 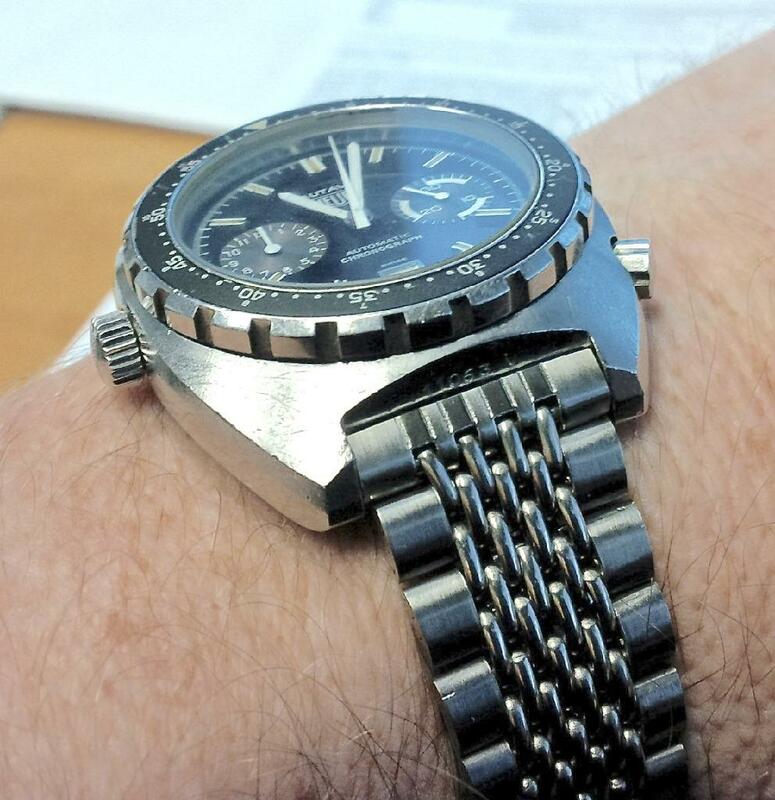 Young guy at the watch shop really liked the finished product. 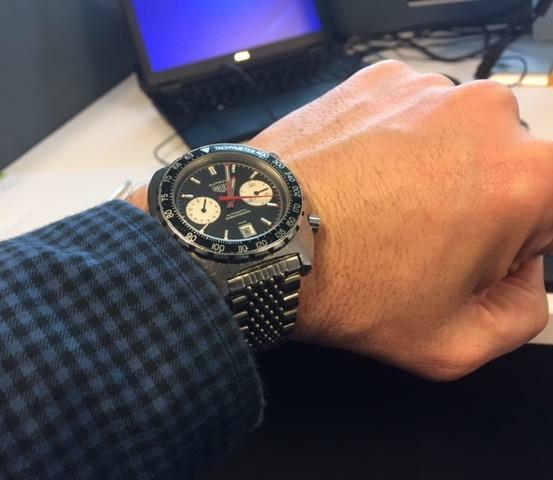 He didn't realize that "Heuer" existed before "Tag Heuer," so apparently he has never seen Steve McQueen's "Le Mans!" CUSTOMER QUOTE: "Success. Looks great. Thank you for the help!" CUSTOMER QUOTE: "The eagle has landed. Looks great. Thanks." 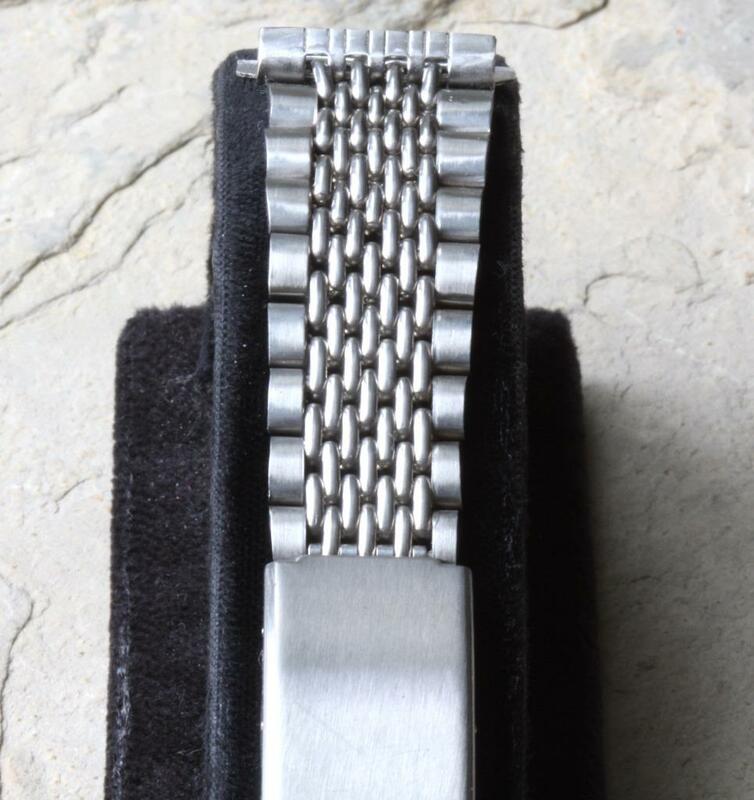 The Beads of Rice band is a 4x3 row New Old Stock 1960s/70s vintage watch bracelet with the same overall look as the Gay Freres bands that went on popular 1970s Heuer models. 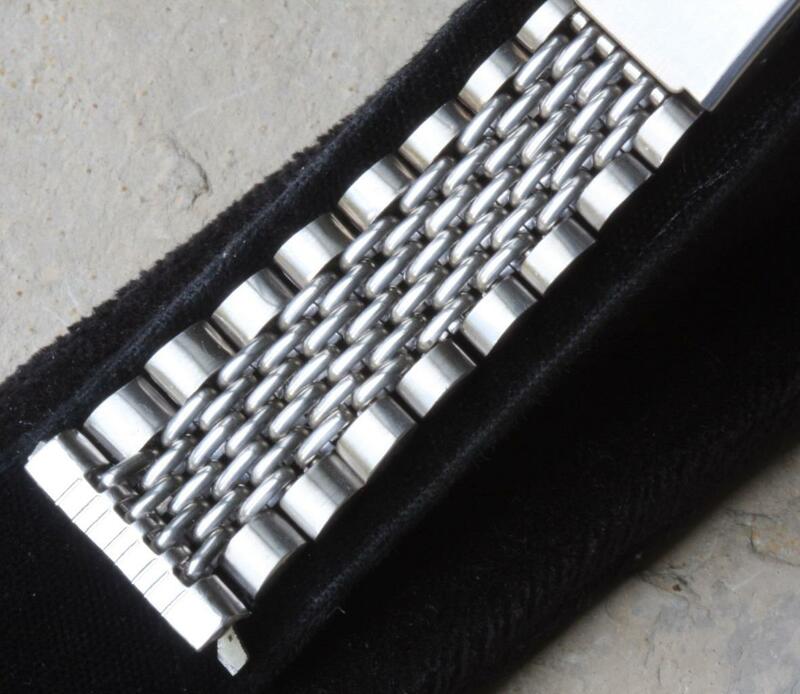 The band has 4 end beads that go into the 21mm straight-end pieces. The links flare out gradually to 19.8mm at the ends, so the transition to the end pieces is perfect. Good length is 6 3/8 inches (16cm) fully extended and sizes down to 5 5/8 inches (14cm) with the adjustments in the clasp. 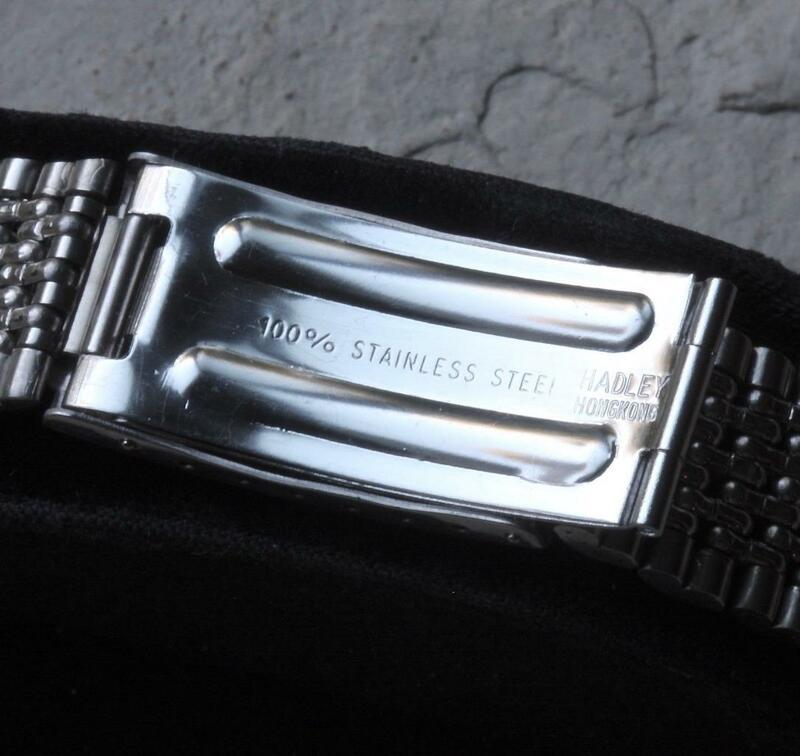 Signed on the back of the clasp "100% Stainless Steel Hadley Hong Kong.” You can remove links to make it shorter. 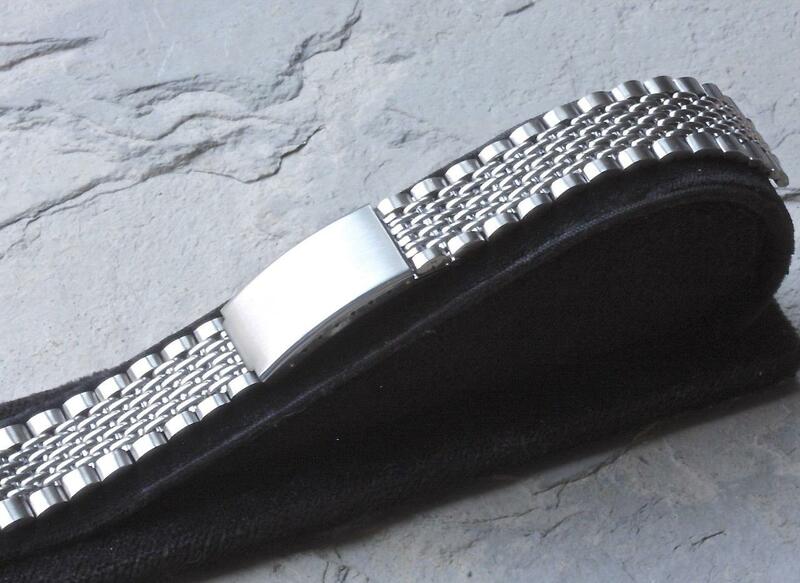 Clasp is 17.4mm wide. Links are 2.8mm thick. Band weighs 33 grams. 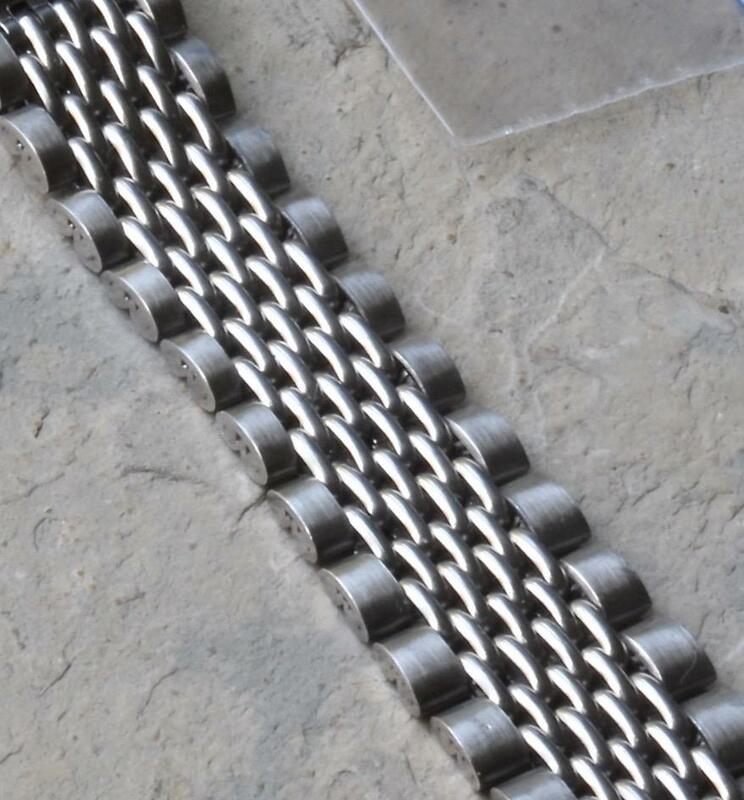 The band has the more narrow beads than the standard 3x2 row pattern BoRs that are more commonly seen. U.S. First Class shipping for $6.99 or Priority shipping for $13.99. International shipping $70 for Express (arrives in 5-7 days) or $115 for FedEx. 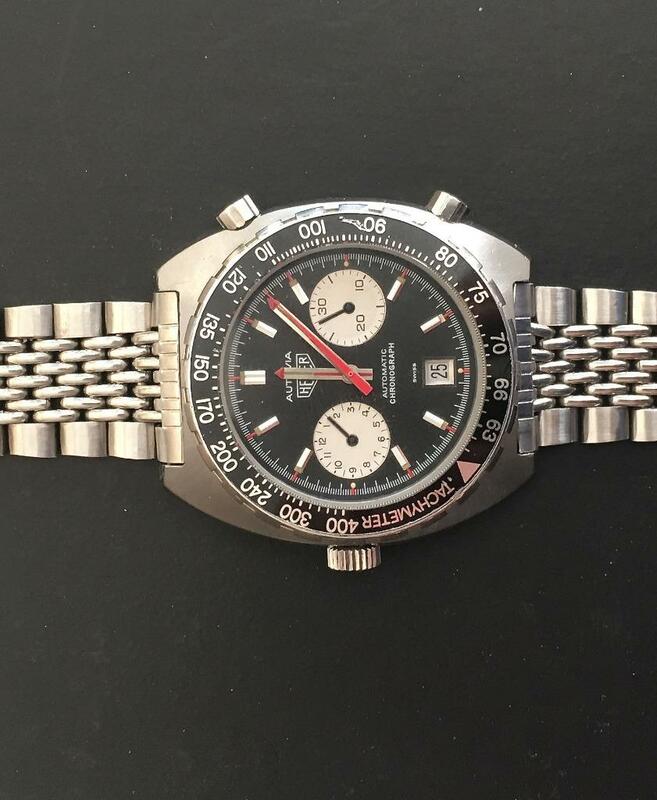 Do you have a Heuer 1163 case Autavia? We also sell a similar modified 20mm wide ends BoR band for the 20mm straight-lug Autavia 1163V, 1163T and other models. Email billmahoney@aol.com for details. See our full selection of Beads of Rice bands at Squinky.com including BoRs in 17.3mm, 18mm, 19mm and 20mm. 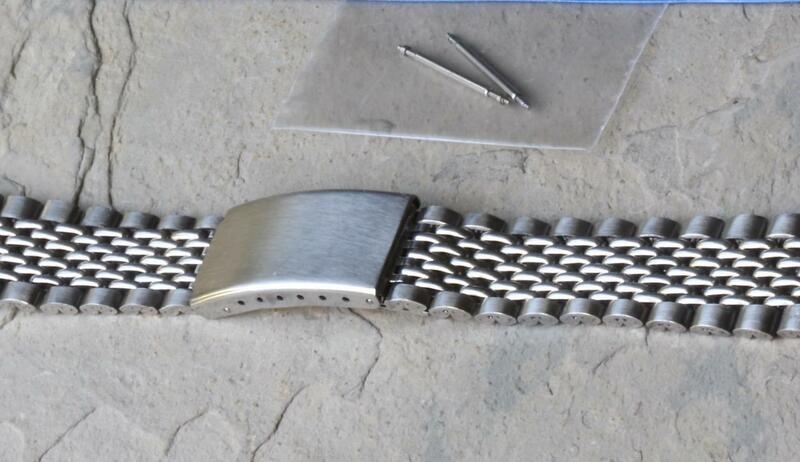 We also know have rare 22mm size BoR bands in stock with curved or straight ends.